An extremely entertaining look at electronic-iconic monoliths Depeche Mode in an unlikely collaboration with respected documentarian Pennebaker (GIMME SHELTER). The concert footage shows the group at their performing apex, and mixes with an intelligent and shockingly personal investigation of a band and their fans. This was the concert film/band portrait that shook the world of every black-clad high schooler on the verge of the '90s, and is brought to you on the big screen for the first time anywhere in decades. Rare 35mm Screening! Sponsored by Austin's End of an Ear Records, and vintage furniture and decor store, Room Service. 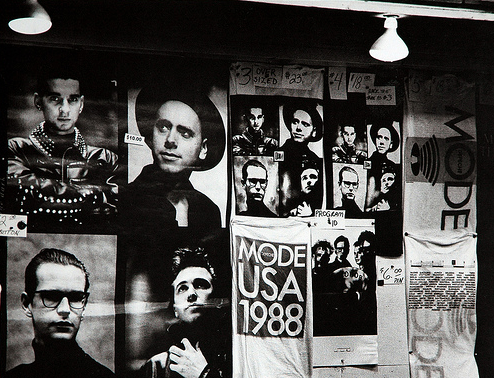 "On the road with the pioneer synth/pop band Depeche Mode. More than that, this is a story of music in the '80s, as it weaves together the adventures of the band and a bus full of fans as they travel across the country to the bands final concert in California at the Rose Bowl. A backstage view of everyone, from the band to their accountant, this films reveals the mega-music business in a humorous new way."